Kicking off March with a bang, we are throwing a fabulous San Francisco dinner party in our new space and we are making it extra special with a delicious addition to our regularly curated coursed menu. We have paired up with John Korkidis aka ChronVivant, a cannabis mixologist, educator, and the founder of Proposition Cocktail Co (a line of zero-proof CBD cocktails) to bring you an elevated paired beverage with every course. Upon arrival, you will be greeted with a sampling of delicious, mildly infused edibles from both the chef and a local edible manufacturer. Here you will have a chance to grab an infused or non-infused drink from the bar, meet and mingle with all of the other guests as well as sample products from our other sponsors. After the welcome hour, we guide you to the dining hall to indulge in a four course pre-fixe menu (vegetarian available) of non-psychoactive cuisine accompanied by beer and wine. Enjoy handcrafted fresh mocktails that are expertly paired with every course. Between each course, we will be sampling a carefully curated list of different cannabis joint intermezzos from a local farms including sativa, cbd and indica. Chef Coreen and her team will prepare your meal as her husband and cannabis entrepreneur Ryan acts as your host for the evening. We will guide you along your journey of exploring an array of cannabis while discussing the current and future climate of the cannabis industry in California. Our goal is to create a comfortable and relaxed environment that includes cannabis education, tasty food, plenty to drink and wonderful people. At the end of the dinner each guest will be taking home a gift bag with a sampling of some of the evening’s offerings and a few surprises. Dietary Restrictions: We are serving a pre fixe non-medicated menu for the dinner. We do have a vegetarian option available for this event and all menus are generally gluten free, although not certified GF. Please make sure we are notified of any allergies no later than 48 hours before the event. We will try to accommodate as best we can. 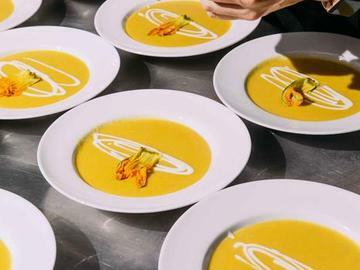 Vegan options are NOT available for this specific event as doing so requires substantial disruption to the flow of a meal that is designed to be the same for an entire seating of diners, and requires dedicating too much of our kitchen’s resources to a small number of those diners. We recommend that diners come with an open mind, ready to try new things they might not ordinarily prefer, trusting that they will undoubtedly find most things easy to like.